Pops awoke on pavement. A rock on the sidewalk had burrowed into his cheek. He rolled over onto his back. Eyes closed, he tested himself for injuries. One fist opened and closed, then the other. He stretched out his right arm, then his left. Knees and ankles popped as he bent and unbent his legs. His head ached, as always. At least he still had his shoes. Pops opened his eyes and saw a ceiling, which gave him a start. Then he noticed a patch of sunshine. He pushed himself upright to rest against the wall. He must have been mighty drunk to fall asleep so far from his usual place. More drunk than he would have had money for. He closed his eyes, trying to remember. Something shifted beside him. Pops jerked away. A young man lay there, muttering in his sleep. He had soft black curls, full, pale lips, and long eyelashes. A thick scar ran along the edge of his hairline. Young man? A boy, really. Who must have shared his stash. Pops wondered what he'd given in return. There was no free lunch on the streets any more than in the world of high finance. Even the soup kitchens expected you to pray to their god in return. Pops needed to figure out where he was, and how to get back to his vacant lot under the freeway. He was safer there in the wide open. If the bus had been involved, he could be anywhere in the city. If a car, he could be almost anywhere in the world. Up the street a group of men and women stood at a bus stop. Latinos, with a few white folks too. Signs on the shops were in a mix of mostly English and a little Spanish. At least he was still in L.A. The young man smiled, happy that Pops had stayed after all. "Let's get breakfast," he said. Pops frowned. "Ain't got money." The young man shook his head. "Don't worry. I know somebody." He stood, but got hit by the wobbles. He leaned into the wall for balance. Pops put a hand on the young man’s arm. "Steady on, son," he said. The weight of the old man’s hand felt reassuring. "Thanks," he said. Pops and the young man walked side by side up the city street with other people making their way to the places they had to be all day. Pops finally saw a street sign. York Boulevard. He tried to remember where the hell York was. The young man felt warmed by the rising sun and by the old man’s presence at his side. He could imagine the two of them roaming the country together. Taking their meals and sleeping side by side in nooks and crannies most people didn’t know existed. Pops was an educated man. He imagined sitting by a campfire listening to Pops tell yet another of the books he'd read, just like he had last night. Pops followed the young man up an alley. They approached the back door of a shop that was redolent with the smell of corn and chili. Pops' mouth watered like one of Pavlov’s dogs. He stood a little ways back while the young man knocked on a screen door. An old woman with long gray hair and a flowered apron over her clothes opened the door. "Hola, Maria," the young man said. "¿Como está?" Maria was overjoyed to see her grandson again after so many weeks. At the same time, the crack in her heart broke open a little wider. How was it Miguel knew to return here, but didn't know who she was? Couldn't remember the countless childhood days and nights he'd spent here in the family restaurant?"Hola. ¿Tienes hambre?" "Sí," he said. "We're both hungry." Maria looked the old wino up and down, repressing the urge to cross herself. He was filthy, emaciated, and he stank. She couldn't let him inside. Pops knew that look in her eyes. He should go. But the smell of food stilled his legs. This old woman was going to feed them. "Sit down," Maria said, gesturing to some white plastic chairs behind the shop. Pops and the young man sat. 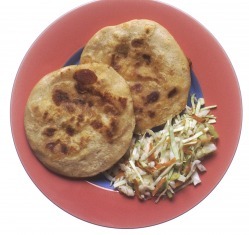 Maria returned from the restaurant with two plates piled high with flatbread, beans and cabbage. "Pupusas!" Miguel said with delight. "My favorite. How did you know?" Maria watched the two men shovel food into their mouths, barely stopping to chew. Her own beloved Miguel was becoming one of these street people, and she couldn't stop it. So she vowed to continue feeding him and these filthy old men he brought with him, just to keep Miguel coming back. Perhaps one day he would remember. Pops ate half of what was on his plate before he had to stop. He'd be lucky to keep that much down. Miguel noticed Pops wasn't eating. "Maria?" he said, "Could you bring us coffee, and a takeaway bag?" Tears filled her eyes as she went back into the restaurant. When she was gone, Pops said, "Thanks for the grub." Miguel said, "Sure thing, Dad." Pops stood abruptly, dropping the plate. It shattered, splattering food around their feet. The young man knelt. "I'll take care of it, Dad." He swept the food into little piles, rubbing the skin of his fingers open on the rough pavement. "Who are you?" Pops said. The young man stood. "We haven't seen each other since social services took me away, after the earthquake," he said. "It's like you said last night, we're so lucky to have found each other." Maria stepped out the screen door, paper cups of coffee in hand. "You are not my son!" Pops turned and ran. He didn't look anything like Isaiah. Miguel ran after him. "Dad!" he shouted. "God has brought us together!" The old woman cried out, "Miguel!" But her grandson was gone again.